In October we visited London. We have had that trip in our minds for so long, that we created some kind of fuss about it- it should be the perfect time of the year, we should stay longer, we should plan well in advance... When we finally booked the tickets in April, I started researching a bit (ok, a lot), and it was overwhelming. All these blog posts, guides, ultimate lists, friendly recommendations for museums, cafes, quirky neighborhoods, markets, department stores, parks... picnics, afternoon teas, lunch spots, Gin breweries, pubs... Where should I start? Will I waste my week in London because of poor planning? My plan was to do London a neighborhood a day, for it would save us time. Turned out, it was all so exciting that we would start the day at the Tower Bridge, explore all the nooks and crannies of the City, then take a long walk down the South Bank, hop on a bus to Belgravia just for some very famous cupcakes, then head to Soho (as it was our go-to destination almost every evening), to have one last beer in one of the pubs of Clapham. For someone who hasn't been to London, what I just said doesn't mean much, but let's just say we didn't do London a neighborhood a day, we were all over the place. I'm not a big fan of writing lists on what to visit, there's always something (or a lot of things) that you'll definitely miss, but I do enjoy reading them. And with London, I think the most useful thing for future travelers would be to write down things that we enjoyed most. The list won't be complete, that's for sure. With a town so big, diverse, ever-changing, traditional and modern at the same time, it would be hardly possible to write a complete guide (well, at least for me). I don't consider myself an expert in London travel, heck, I visited for the first time in October, and stayed for a week. Had I stayed longer, I would write guides to neighborhoods, theaters, department stores or pubs. But, for a start, let me share with you all the things we enjoyed in a week. If some of it proves useful to you, excellent. King's Cross. For a Harry Potter nerd that I am, arriving in London at King's Cross railway station was the perfect start of the week. We hopped off the airport shuttle bus and went directly to Platform 9 3/4 where I had my photo taken jetting off to Hogwarts, and then went to buy a golden snitch necklace for my friend's birthday in the shop next to it. If you're not such a big HP fan, King's Cross is still worth visiting, especially for the architect John McAslan's glass and steel vault. Next to the station, we discovered the coolest, most delicious sandwich shop in all of London. Called Kiosk, it serves sandwiches with salted beef and deli pickles and mustard, or with turkey, bacon and onion relish... you get the idea. It tastes even better than it sounds. Tate Britain. There's a lot to choose from museums-wise in London, and we only got to visit Tate Britain and Tate Modern, deciding on less is more approach, that is, a more detailed visit to these two museums. The entry to both of them is free of charge, however, you can make a donation if you want to support the organization. Tate Britain has an extensive collection of British art from 1500 to the present day, with its highlights being (at least for me) the Turner collection in the Clore gallery and the Pre-Raphaelites and British Impressionists in the 1840 room. An impressive space-art connection is to be seen in the Duveen galleries where each year a British artists makes a new work fitting for the grand space of the galleries. I could wander the elegant rooms of Tate Britain for days. Westminster Abbey, Palace of Westminster and Big Ben. I have to admit that we only got to see these three landmarks from the outside, Palace of Westminster (commonly known as Houses of Parliament) being a bit complicated to get into (and by complicated I mean you need to plan in advance), and Big Ben (apparently the most photographed building in Britain) being under renovation. The palace and its bell tower were built in Gothic revival style by the architects Barry and Pugin after the old palace burned down in 1834. Not only is it one of the most iconic London landmarks today, but even Claude Monet picked the building as a motif for his Houses of Parliament series. We wanted to visit Westminster Abbey during the choral service, but we ended up in a different part of town each day around 17 h when the evensong is held. An imposing gothic structure has served as coronation and burial site for British monarchs since 1066. As expected, this is probably the most touristy part of London, a place where large groups, individual travelers, doubledecker buses as well as tour buses meet. Bus ride. We took the iconic red doubledecker buses a lot, especially in between central neighborhoods such as Westminster, City, Belgravia, Notting Hill and Soho. Why am I including this on my list? Because it is a perfect way to see the city from above, especially if you get to sit in the front row of the deck. Oxford Street, Regent Street, and Piccadilly Circus. When I first saw Oxford Street leaving the Oxford Circus Underground station it was by night, the festive lights above the street already on (even though it was October), the buildings looking majestic with facades all lighted up, giant shop windows luring shoppers in, red busses buzzing down the street like in the famous Harry Potter scene. I felt like I was teleported to New York on Christmas, only, I've never been to New York and it wasn't even December yet. This area is probably the busiest shopping district in all of London, with big clothing chains having their flagship stores here. Soho. On our first day in London, after checking in at our Airbnb, we went directly to Soho. From what I've read online it was a central, lively neighborhood, a bit quirky, with lots of bars and restaurants, so what better way to get to know the city? We instantly loved it, going back to it almost every evening. 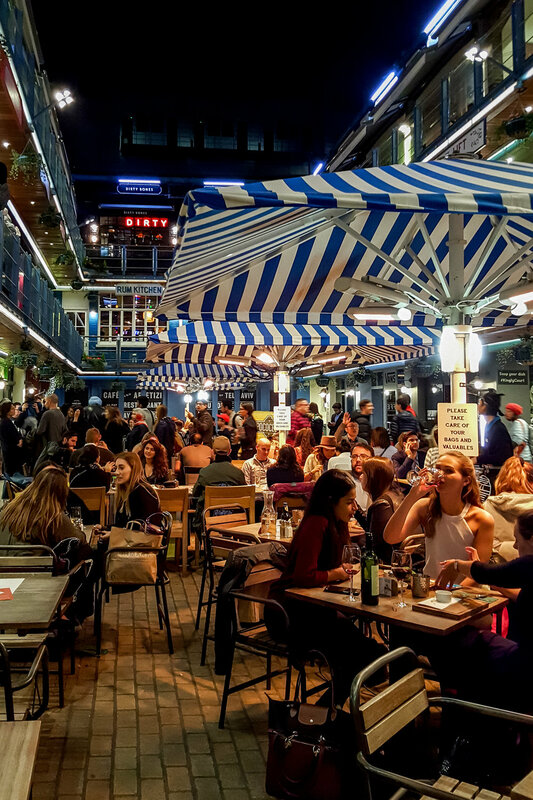 We found our favorite restaurant there (Bao, will explain later), and a favorite ramen joint (Shoryu)- situated in a cool foodie complex called Kingly Court (a number of restaurants, bars, and cafes are brought together around this hip courtyard). Then there were some nice pubs as well (we had a couple of beers at The Clachan and at the Shakespeare's Head), and loads of cool stores to snoop around. I especially enjoyed walking up and down Carnaby street, shiny ornaments hanging above it, making any day of the year feel festive. Liberty London. Liberty London is not your usual department store. Founded in 1875, it soon became the most fashionable place to shop for home goods, fabrics, and clothing in London, drawing in famous clientele, such as the above mentioned Pre-raphaelite painters. When Art Nouveau style emerged at the end of the 19th century, Liberty was one of the companies that supported it, collaborating with British Art Nouveau designers. It played such an important role in the development of this new style, that in Italy, Art Noveau was named Stile Liberty, after the London department store. If this story isn't interesting enough, then there is the building- built in 1920 in Tudor revival style, a style that imitates medieval cottages and country houses, it has a half-timbered facade, steeply pitched roofs, mullion windows etc. Wooden floors, staircases, and pillars on the inside made me feel like I was in an old-fashioned, children's toys store. I was particularly drawn to their fabulous fabrics, and then, of course, to the cosmetics and food department. Fortnum&Mason. Where in Liberty I was just looking around, here I couldn't resist a little indulgement (teas are definitely my weak spot, also packaging design, and both of them are exceptional at Fortnums). As you may have guessed, it's another department store, specialized in quality teas and food. I would go as far as to say it's heaven for tea lovers and foodies, with its grand interior design and all. In a time when everything has to be fast- fast fashion, fast food, fast grocery shopping, and there's often so little value added to the items we take home, I enjoyed taking my time, opening tea cans, smelling different blends, reading descriptions (such as "This blend recalls the ancient trading routes that brought tea to the Tsars in a 'caravan' of camels."). I opted for above-described tea, the Russian caravan, (immediately imagining myself riding in a carriage during Russian winter, cloaked up in colorful shawls, drinking black tea to warm myself up), orange blossom scented green tea (the smell took me back directly to May three years ago, when we wandered the gardens of Villa Pisani near Venice, breathing in the scents of orange and lemon blossoms in the Orangerie), and delicious salted caramel cookies to go with my tea. Cookies are long gone, but teas are still on my tea shelf, enjoyed on special occasions, reminding me of London. Tower Bridge. When thinking of iconic London landmarks, this will definitely pop in my mind (there will also be a red bus, a red phone boot and colorful houses of Notting Hill). 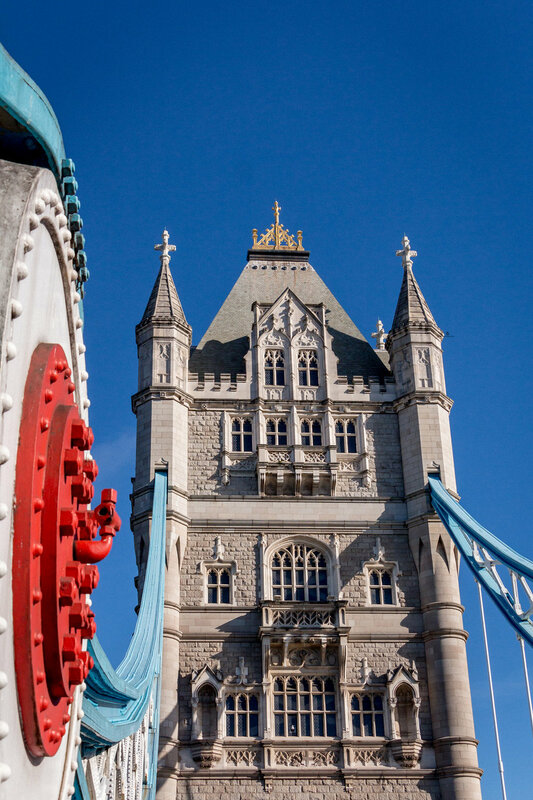 Tower Bridge was built at the end of the 19th century, on a spot where those wishing to cross the river had to do it by a 410-meter long underground tunnel called Tower Subway. At the time very popular Gothic Revival style was used for the bridge, and eventhough the design faced some criticism in architectural circles back then, today it proves to be a very popular tourist spot. We saw it for the first time on a gloriously sunny and bright day, from the left bank of the river Thames, in the exact moment when it started opening for a ship to pass (it's a combined suspension and drawbridge), and I have to admit that we were stunned. On the south bank of the river, there is an architecturally interesting City Hall designed by celebrated British architect Norman Foster, and on the north bank another one of iconic London landmarks, that is Tower of London. City and St. Paul's cathedral. 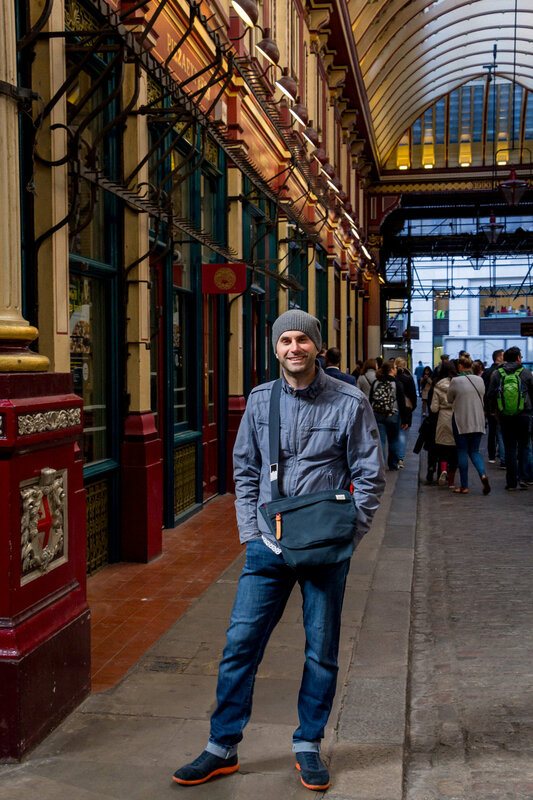 Even though we rarely take guided tours when traveling, we decided to explore the City of London with Strawberry tours guide. And guess what? It was an excellent idea. There is a lot to see in the City, but somehow it doesn't seem to be on top of visitor's list. First of all, City is a place where London was founded, as Londinium in AD 50. Second, it still has a status of a city (along with City of Westminster) inside the metropolis of London. We were guided from the Tower of London to St Dunstan in the East Church Garden (a gothic church destroyed by WW2 bombing, and turned into a garden surounded by ruins). Then we took a walk around the business centre of London with its famous skyscrapers such as The Gherkin, The Walkie-Talkie, The Inside-Out Building, The Cheesegrater... Obviously Londoners like to give their buildings nicknames (already in the 19th century the clocktower of Westminster palace became Big Ben). 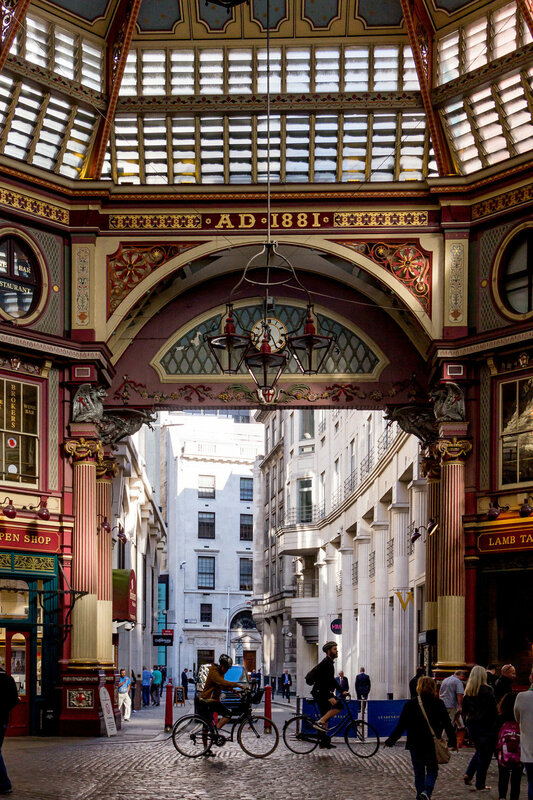 Then the elegant Victorian Leadenhall Market appeared in front of us, with its shops, pubs and restaurants (all looking and smelling very inviting), a place where Diagon Alley scenes in Harry Potter Series were filmed. We took some charming back alleys to the Bank of London and then walked to majestic St Paul's Cathedral. Built after the great fire of London (1666), designed by great British architect Sir Christopher Wren, it has been a symbol of the nation ever since. During the WW2 bombings, there was a special volunteering fire unit devoted to helping the Cathedral survive, with Prime Minister Winston Churchill declaring that Wren's masterpiece should survive at all cost, boosting the morale of the citizens. Thankfully, it survived and is today one of the unmissable landmarks when visiting London. I would suggest visiting during Evensong, as it is a very special, solemn experience (and if you are tight on budget, it is also an opportunity to visit the cathedral free of charge). The Walkie-Talkie and the Sky Garden. I already mentioned the Walkie Talkie building above, but let me say a bit more. Officially called 20 Fenchurch Street, it was designed by Rafael Vinoly and completed in 2014, an interesting design widening with height to maximise floor space on top of the building, where rents are usually higher. There was some criticism following the completion of the building- comments on looking bloated and sticking out the city skyline like a sore thumb being some of them. Then something the architect didn't see coming happened- the concave glass facade facing the Thames, started reflecting sunbeams in a way that temperature on the street level rose to 90 degrees Celsius, melting a car parked on the street. Allegedly people went to the street frying eggs on the pavement. The improvements have been made, and no eggs have been baked on the street ever since. For a nice view of the city, you can climb to the top floor of the building, called Sky Garden. It is a giant, well-lighted space with greenery, and a couple of bars and restaurants. The visit is free of charge, but you have to book your timeframe in advance. Bankside and South Bank. 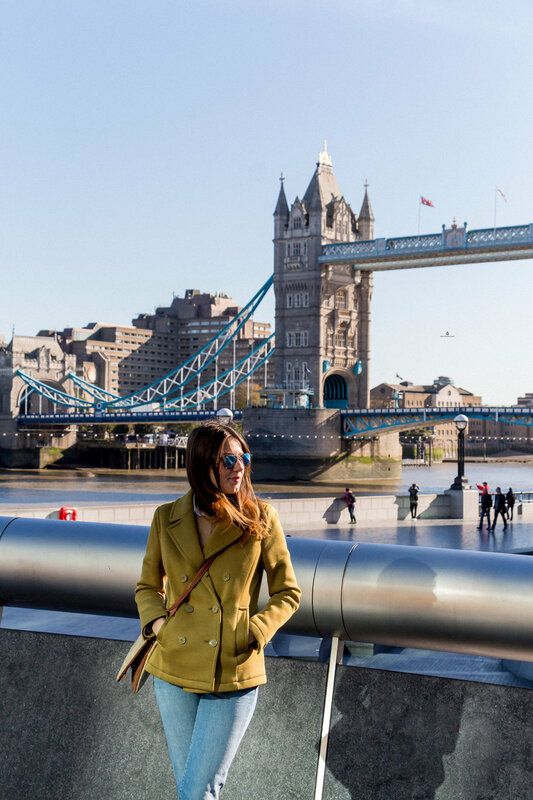 A walk along the south bank of the River Thames all the way from Shakespeare's Globe to Westminster Bridge is a perfect way to spend an afternoon (especially if you just visited Borough market and wanted to taste a little bit of everything). You will pass by Millenium Bridge, Tate Modern, National Theatre, London Eye, just to name a few. Then there are bars, restaurants, galleries, arts and entertainment venues and a general buzz of the streetwalkers, runners, kids, dog owners, street musicians, skaters, stand up comedians, poets that offer to write a poem on any subject you like, and that on a typing machine (we were tempted to ask for a poem but felt just a little bit embarrassed, so maybe next time. It's a wonderful idea in any case!). More on the area here and here. The Temple Brew House. We ended up in this pub after a long guided tour of the City, craving hearty British dishes and beer. We loved the rough, industrial, and somehow at the same time cozy and welcoming interior design, friendly waiters and especially the food. I went for mac'n'cheese, Luka for fish and chips, both of them British classics, both going extremely well with beer. A couple of days later, we met there for a couple of beers with my cousin, so I'm considering it our place now. 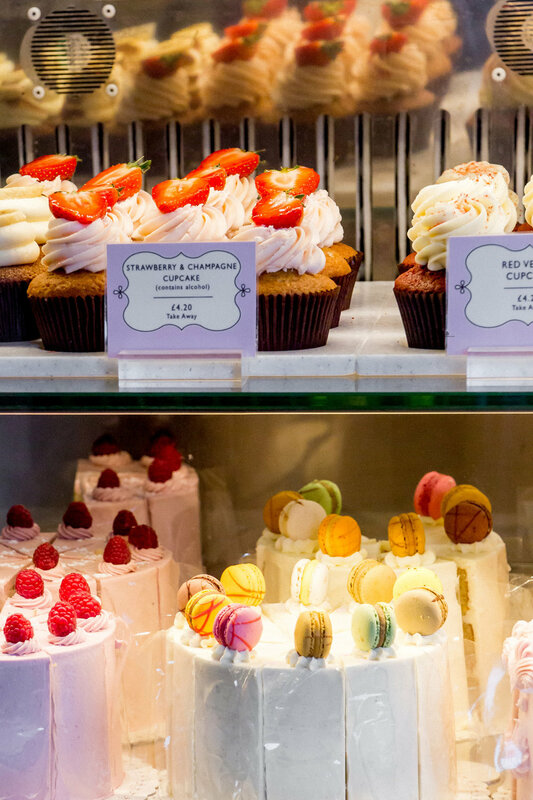 Peggy Porschen. I was very eager to indulge in some proper British cupcakes, even before coming to London. So I did a little research, browsed some blogs, consulted some travel pages. All of them were pointing to Peggy Porschen in Belgravia, so of course, we ended up there one late afternoon, a bit tired and a bit cold. We couldn't find it at first because I wrote down the wrong address, and when we asked a young woman on the street for help, she said: "It's a couple of blocks away on the right side, you will see it. There's no chance you'll miss it". When we finally got there, we saw what she meant- pink facade, flamboyant decorations, pumpkin garland around the entrance, and then a line of people waiting to be seated. Our first impression was, well, disappointment- there were more people taking selfies and photographing the food than actually eating it. But, when we finally got our table, and when our Banoffee pie and salted caramel cupcakes arrived we were won over. Creamy, full of flavors, and beautifully presented cakes (*that I sometimes wish to have delivered here in Zagreb). Buckingham Palace. It wouldn't really be a trip to London without visiting the Buckingham Palace, London residence of British royal family since Queen Victoria moved in in 1837. The state rooms are open only in August, September and certain days of the year, so we didn't get in the palace, but we took a look of the East Front, or the main facade on a late afternoon in October (and there was only a handful of tourists!). The guards were there, steady as ever (I remember grandma's sister having the Queen's Guard Statue doll carefully stored in a box. Each time I visited, I'd politely ask for permission to carefully play with the doll.). It was cold, we were tired, so what better way to spend the evening than hopping on a bus to Harrods and see for ourselves what all the buzz was about? Harrods. Harrods in October looks like a very glamorous and monumental Home Alone movie festive Christmassy set. You spot it right away walking down Brompton road from Knightsbridge Station, it's not something that could easily be missed. And then when you enter it there are good chances that you will get lost at some point. We started with food hall and climbed up the women's and men's clothing, homeware, books, to Christmas decorations and perfumes. You can imagine that it is all very glamorous and a bit kitschy on the inside (there is for example an Egyptian staircase with giant Nefertiti and Sfingas busts, monumental pillars and acanthus leaves everywhere, looking a bit like a theme park). Nevertheless, I enjoyed the experience of marveling at all the designer dresses I don't usually get the chance to look at (I'm a real sucker for dresses too), browsing the books section, trying the perfumes, taking photos of food section (all neatly arranged and beautifully packaged). We left with a couple of brownies, and one particular perfume on my wishlist. Millenium Bridge. Another sight for Harry Potter fans, at the beginning of Harry Potter and the Half-Blood Prince movie, Millenium Bridge collapses during Death Eaters attack. In real life, it's a pedestrian bridge connecting The City and the Bankside, interesting for its design, but also for the fact that following its opening in 2000, the bridge proved to be so wobbly, that it had to be closed for the next two years, to complete the modifications on reducing the bridge movements. I always admire the ways London landmarks and symbols end up so beautifully portrayed in books and movies of popular culture, in a way that makes you know the city even though you've never been there. Notting Hill. Colorful houses, independent bookshops, antique stores, famous Portobello road and market, cool shops, and literary and movie references to this neighborhood were what attracted me, and probably every other person to visit. It isn't as romantic as Instagram portrays it with photos of pink houses with beautiful door wreaths and roses growing by the window, because people actually live there, and between you and that perfect shot stands a car, a garbage can, a pile of newspaper, something that gives away signs of everyday life. Having said that, it seems like a very cool neighborhood to live in- just imagine having a bookstore called Books for Cooks around the corner. That also acts as a restaurant from Tuesday to Friday, serving two dishes from the latest cookbooks that came into the shop. This just might be the coolest thing I've ever heard of! We left the store with only one book and a long wishlist. Another shop we fell for was Highland store on Portobello road selling woolen clothes and blankets in beautiful colours and traditional patterns. If you are anything like us, wandering the streets, side alleys and shops of Notting Hill can take half a day. Tate Modern. This modern and contemporary art gallery is based in the old Bankside Power Station, an industrial building on the south bank of the river Thames (very close to Millenium bridge, and on the opposite side of the river from St Paul's Cathedral). After the old power station closed in 1981, the building remained unused for years, until Tate gallery announced in 1994 that it will be home to new Tate Modern. The renovation project was completed in 2000 by architect duo Herzog and de Meuron (and here is a very interesting article about its renovation). 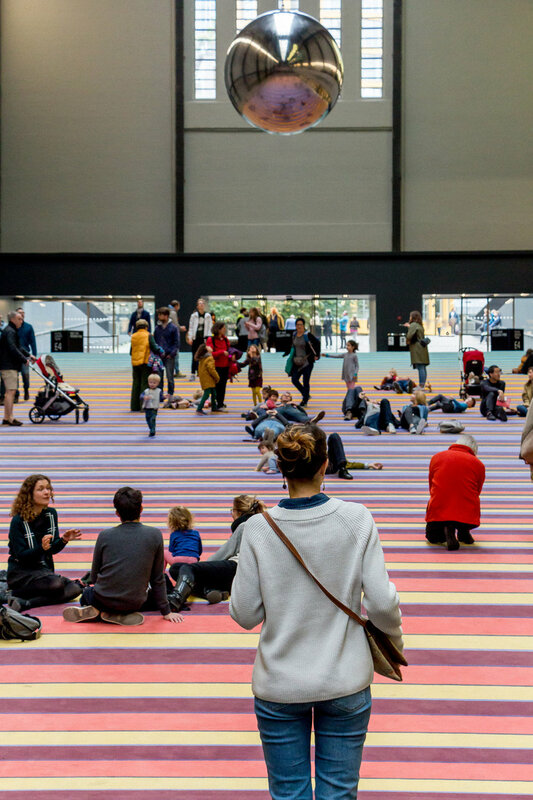 The building is enormous, with giant open space of former turbine hall- at this moment it hosts an installation by Danish artists' collective Superflex called One Two Three Swing! It is a line of swings, for 3 persons each, and from what we've seen, everyone went crazy about it (including us). There were teenage schools kids, elderly couples, parents with small kids, millennials, all of us anxiously waiting to take a spot. After we had our fair share of the fun, we noticed a dad with a kid waiting for a seat. "Please take a seat, this is for children after all. ", said Luka. "We're all children! ", said the waiting dad. There is a very interesting permanent collection on the upper floors, along with temporary exhibitions and an amazing shop, so interesting that we spent the entire morning there and then got back the other day. Borough Market. We had to leave Tate Modern on our first day because we had a date with our friends Alex and Alicia, New Zealanders whom we met on our trip to Puglia, Italy. Even though we spent only two days in Italy together, a foodie knows a foodie, so we all agreed to meet on Borough market, and split into four each food we wanted to try. Borough market on a Saturday is crowded, but also there are so many food stands, so many dishes to choose from (not a case on any other weekday). We tried sausage rolls, duck confit wraps (this was the most delicious thing by far, if you ever get the chance, here is where you can find them), scallops, doughnuts and Scotch eggs. By the time A&A informed us that we were eating the most Instagrammed doughnuts, ours already looked like a real mess (to say it politely), so you'll just have to believe me they were good. You can find really any of your food and drink cravings- cakes, olive oil, Spanish tapas, cheese, olives, Balkan food, curries, grilled meat, cider, bread, fish, pies, there is even a store selling Croatian products! It is really a perfect spot for foodies. Maltby Street Market. After Luka and I satisfied our appetites (and after A&A asked: "How much can you guys eat?! "), we headed to another, quirkier market, housed under the railway arches in Bermondsey. This market had a real local vibe, without the crowds, pop up bars and food stands using warehouse spaces under the railway (there was literary a bar in between the piles of planks). Sadly, we couldn't eat anymore (to answer A&A's question), but there were some seriously good scents of grilled meat and waffles surrounding us. We had, however, a couple of drinks at Bermondsey Distillery, a producer of Jensen's gin, the best one we've ever had (served with a strawberry soda an a strawberry). I would definitely recommend a visit to this place. Royal Opera House. We wanted to see a show while in London, and since we're both particularly fond of ballet, what better way to spend an evening than at Royal Opera House, watching the extravagant Alice in Wonderland show. All the usual suspects were there: the Mad Hatter, the Cheshire Cat, the Caterpillar, the Queen of Hearts, but each of them originally portrayed, with a mesmerizing choreography, acting, and costume design. Then there was the original music, scenography, and the production of such high level that we left the show completely enthralled, with so many impressions to talk about. The 19th-century building of ROH is all grandiose and festive, but in a relaxed atmosphere- even on its website, ROH invites you to dress up or down as you wish. So there were people sipping wine in the foyer dressed in gala gowns and Louboutins, as well as people in tracksuits and trainers. The owner of before mentioned Books for Cooks told us earlier that day that "people watching was the best part of going to a theater", and we sort of got where he was coming from. Bao. It almost happened that we missed what turned out to be our favorite restaurant in London, by far. Alex recommended it before our trip as "great Taiwanese steamed buns and delicious other things" and we would never miss out on delicious things! So we queued for it, on a rainy evening, completely exhausted from all the sightseeing. Do I have to mention it was totally worth it? There were fluffy buns filled with an explosion of flavors of all sorts, comforting soups, rice bowls with guinea fowls, the most tender steaks in soy sauce, steamed kale with tofu, sweet potato chips, trotter nuggets, an ice cream in a fried bun! All dishes beautifully presented in small portions so you can try a bit of everything, and coming in as fast as a hungry traveller wishes. It is a small place, with a comunal bar table and a couple of tables on the side, all pressed together just enough to make for a cozy atmosphere, but still leave you some privacy. The fact that the interior design is simple, modern, and uses mostly wood, only adds to that cozy feel. PS- there are three Bao's in London, and I am talking about the one in Soho. Richmond. My aunt lives in Richmond (also, sir Dave Attenborough), so we naturally had to visit this town on the river Thames in south-west London. Richmond is known for its parks and large open spaces, and also has a lovely center with multiple shops, restaurants and bars, and a lively riverside area. We only got time to take a walk, browse the main street and take a glimpse of the riverside before heading to my aunt's for lunch. It was a cheerful and relaxed family reunion with my aunt, cousins, and their kids, and loads of traditional Croatian/British food (baked whole chicken with potatoes, spinach on milk, braised greens, gravy, salad, different sorts of desserts, it was a classic Croatian way of preparing a feast for guests). We unfortunately didn't have time to take a walk in the Richmond park (it turns out to be enormous, and it could easily take half a day, so we are looking forward to a picnic the next time) or to soak up the views from Richmond Hill (the only view in England protected by an Act of Parliament, and an inspiration for many artists, William Turner being one of them), but we did have the time to visit nearby Kew Gardens instead. Kew Gardens. I'm a sucker for lots of things, including gardens, palm houses, botanical drawings, squirrels running around, giant trees, flowers, ponds, river views, treetop walkways (not that I've been to many of those, but I do remember pedalling on a monorail among treetops in a German theme park when I was about 10). Turns out, Unesco World Heritage Site of Kew Gardens has it all (except, you don't get to pedal, instead you have to walk among treetops). Kew houses "the largest and most diverse botanical and mycological collections in the world", 300.000 printed volumes of plant knowledge in their library, 200.000 prints and drawings, 14.000 trees, but most of all, it is a beautiful garden to get lost in, to marvel at Victorian iron and glass structure of the palm house, and the symmetrical flower beds in front of it, to watch the sunset on a bench by the river, to look up at giant 18th century trees, to have a cup of tea in one of the restaurants or cafes. Just take your time. *Here is a post I wrote about Kew Gardens, with some lovely photos if I might add. West End. Surely if you visit London, you will end up in West End at some point. It is a central area, well known as an entertainment, shopping and business hub. It comprises shopping areas of Piccadilly Circus, Oxford and Regent Street, a large number of theaters and cinemas around Covent Garden and Leicester Square, and then, of course, a cluster of restaurants and bars waiting for all those shoppers and theatergoers. As I mentioned before, we chose a show in Royal Opera House, but there are also famous West end musicals or stage plays like this one I'm definitely seeing next time. For me, attending a show in West End was one of the most fun, genuine experiences in London. Chinatown. We wandered into Chinatown one evening after taking a walk around Soho- suddenly a Chinese gate, red paper lanterns, neon signs, street performers and tempting scents of various Asian cuisines started appearing- an attack on the senses, but in a good way. Given that we had just had dinner at before mentioned Bao, we missed out on numerous restaurants stretching down Gerrard Street, but you can read all about Chinatown dining scene here, here or here. British Library. On our last day in London, we had some time to kill before taking a bus to the airport, and we chose to spend it at the British Library, the second largest library in the world, and a place where I would gladly spend every working day. The building was finished in 1999 by the design of architects St John Wilson and MJ Long, next to St Pancras railway station, becoming the biggest British public building of the 20th century. Except for the fact that it holds over 150 million items, and has a number of manuscripts, books, and maps on display in Sir John Ritblat Gallery, it is an amazing space to spend time in, its centerpiece being King's Library Tower, a six-storey high glass and bronze construction that houses the library of King George III and national Treasures (Magna Carta and Beatles lyrics being some of them). Should you decide to spend a day in the library, there is a restaurant (with pretty wide selection of food), a bar, and a cafe with sweet treats. If you prefer to bring your own food and then sit at the restaurant and eat it, that is also fine (I love the unexpected ways of British "laid-backness"!). There is also a shop, a good one, with not only books but also all those design items you always want to buy in museum stores. Currently, the coolest exhibition is taking place at the library- Harry Potter: A History of Magic. Not only does it display J.K. Rowling's original drafts and drawings, but also rare books and historic magical objects rooted in tradition and folklore of Britain. Sadly, we missed the opening of the exhibition for just a couple of days, but if any of you are heading to London untill the end of February, this is your chance. Hopefully, some of you will find this post useful, and if you do, please let me know. I love to have feedback on the work I do. Also, let me know if you'd like to read another London-themed post, perhaps about the magical Kew Gardens (there are some pretty nice photos waiting to be published).